Ader's flying bird 'Eole' ('Aole'). This aeroplane was designed by the French aviation pioneer Clement Ader (1841-1925). It was steam-powered, had a wingspan of 15 metres and was of wood and aluminium construction. Ader claimed 'Eole' to be the first piloted plane to take off under its own power on 9 October 1890. 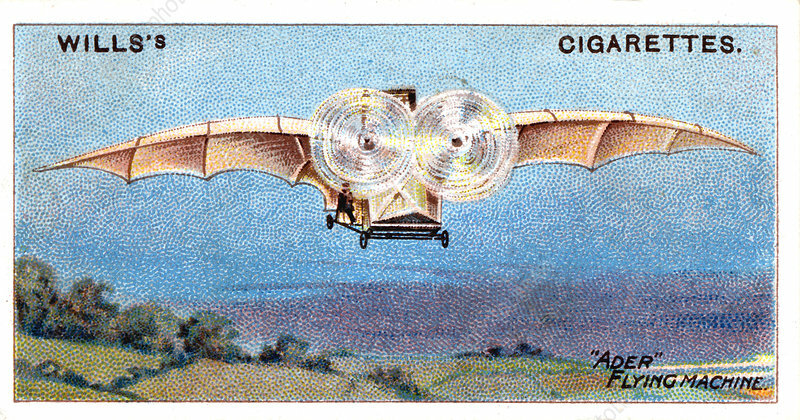 From a series of cigarette cards on aviation issued c1910.